Another straightforward and comfortable bus ride brought us to Palenque, on the border of the jungle. We headed up to reception to try to find out where the police station was in Palenque. What followed was a very confusing conversation. He spoke some English, but his comprehension wasn't great, and Zev was struggling to communicate in Spanish - they didn't cover reporting a theft to the police in middle school Spanish class. First, the receptionist told us that there was no police station. We tried to ask who he would call if someone broke into his house. He got on the phone and started calling someone, but we weren't sure who. Eventually, he hung up, and told us that he'd called the bus company and that no one had handed in the camera. We explained again that it wasn't lost, it was stolen, and we wanted to report it to the police. Eventually, we just asked him to call a taxi to take us into Palenque town and we'd figure it out from there - this wasn't getting us anywhere. Ten minutes later our taxi pulled up, and the receptionist went to talk to the driver. We heard him explaining the situation, and then he said, "He'll take you to the Police." So after all of that, apparently there was a police station! A short drive later, we were dropped off outside an unmarked building with lots of heavily armed police outside. This was looking promising. After explaining the situation AGAIN, the very nice officer asked us to get in the car, and started filling out a report as we drove. She asked us for all the details, and as best we could, we filled her in. Once we arrived at the office, we stayed in the car and she asked Zev to write, in Spanish, his version of events. With a little help from the officers, and a lot of help from Google Translate, we managed to get it done. Next, they took us into the office, where they made copies of all the forms for us, and explained that this should be sufficient for our insurance, but technically there wasn't much they could do because the theft actually happened in another state (Palenque is right on the border). We really only needed the paperwork anyway, so we thanked them. They even gave us a ride home! If we had to have a police encounter in a foreign country, at least it was a pleasant one! After a slightly traumatic introduction to Palenque, we were ready for something positive the next morning. We ate an early breakfast at the accommodation, and walked into the Maya Biosphere Reserve (within which the ruins lie) entrance right next door. We paid our entry fee, and jumped in a passing collectivo to the entrance to the ruins. We had almost hired bikes, and as the collectivo climbed the hill, we were so glad that we hadn't. We alighted in a typical stall-filled carpark, ignored the cries of people trying to sell us hammocks, paid our entry fees for the ruins, and headed in to the park. It was only about 8.30am, so the ruins were still delightfully quiet and peaceful. The ruins are spread over a massive 15km2 site, but only a small few have actually been excavated. Even those that are excavated lie in close proximity to the jungle, and bird calls and the screech of howler monkeys echoed through the air as the morning fog still clung to the ruins. Although Zev was still devastated by the loss of his camera, I managed to convince him to snap a few pictures on his phone. One of the first things we saw as we entered the site was the Temple of the Inscriptions. At 60m wide and 27.2m high, it was pretty hard to miss. The temple served as a tomb for Hanab-Pakal, discovered in 1952. Hanab-Pakal's remains were found in a huge carved sarcophagus, surrounded with ornaments. The sarcophagus is no longer there, but you can walk around inside the pyramid. We saw the sarcophagus on display in the museum, but it was unclear whether this was the original or a replica. The Palace is a complex of several connected buildings and courtyards that was undergoing some serious maintenance during our visit. Despite heavy construction, we were able to explore the underground labyrinth that eventually led up to the upper levels of the palace, where we got some great views out over the sites. This set of three temples (The Temple of the Sun, The Temple of the Cross, and The Temple of the Foliated Cross) are each perched on top of steep pyramids, and each contain a carved relief in their main chambers. By the time we were done exploring them, we had some seriously burning thighs! 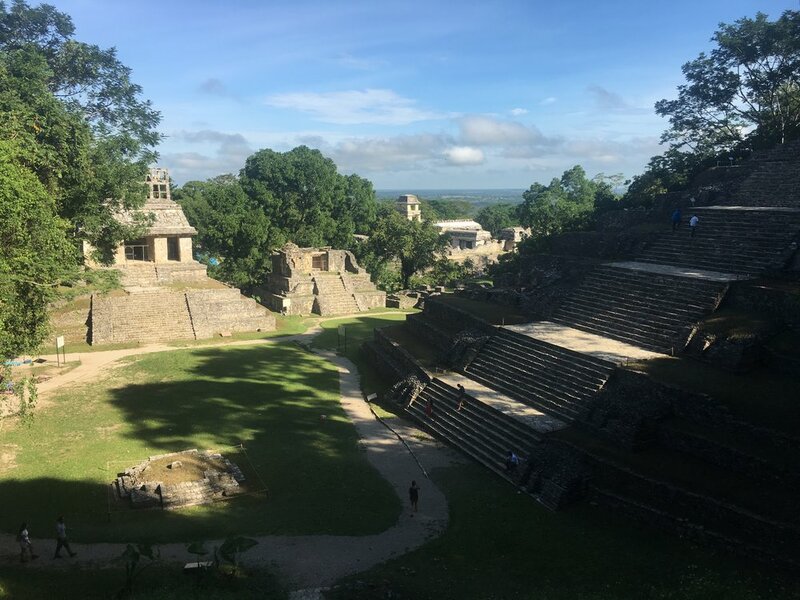 Next, we checked out the ball court (which was much smaller and less remarkable than the one we'd seen in Chichen Itza), some smaller temples in the North Group, and the Temple of the Count, which once housed an explorer who decided that it was his new home. On the way out of the complex, we passed through some smaller ruins, and eventually ended up back at the main road, right outside the museum. It was a shame it wasn't at the entrance, as it contained a lot of interesting information about the area and the ruins. Thoroughly exhausted from our morning's climbing, we headed back to the accommodation for a lazy afternoon of relaxation!